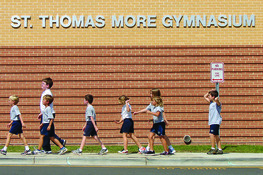 Welcome to St. Thomas More Catholic School Serving students from Pre-K3 thorugh 8th Grade, we provide a rigorous education within a community dedicated to faith, respect, excellance and service. Our 23 tree-filled acre campus resides in the heart of central Chapel Hill, NC. In addition to the church & parish center, St. Thomas More Catholic School includes a 6th-8th grade Middle School building, a PK-5th grade Lower School building, an Art & Music Center, a Gymnasium & Athletic Field, plus playground areas.